I love trying cuisines and simple cooking techniques from other cuisines and this recipe that I ripped off from a Brazilian food show turned out so nice that it was licked clean and I was stared at for making 'very little.' When food turns out good, no amount is ever enough, so I can't be blamed. A farofa is Brazilian stuff made of tapioca flour and the main course is a name that I cannot pronounce (or spell), made of different parts of beef/lamb, but I made the whole thing with chicken and adjusted the cooking time accordingly. You should try this at home because if you do it right, it is easy and tasty! A detox patient of mine tried it because it had everything that was allowed for her to eat and raved about it! 2 small pieces of ginger, crushed. 1 clove of garlic, crushed. Start with a nice pot and add some olive oil and butter till the butter softens. Add the ginger, garlic and chilly one by one and stir for a bit. Add the black beans, enough water to cover the beans, some salt and simmer for about 20 minutes or till the beans are almost soft and then add the marinated chicken breast to the pot. Cook for a few minutes till the chicken is cooked through and add the cornflour (mixed in water) to thicken the sauce. Cook covered till the sauce thickens. Farofa time. While the pot is boiling away, in a separate pan, add the butter to melt and add in the ginger,garlic and chicken salami and cook for a few minutes, till the salami starts to brown. Add the bread crumbs and cook till the flavour of the bread fills the air, about 4-5 minutes. 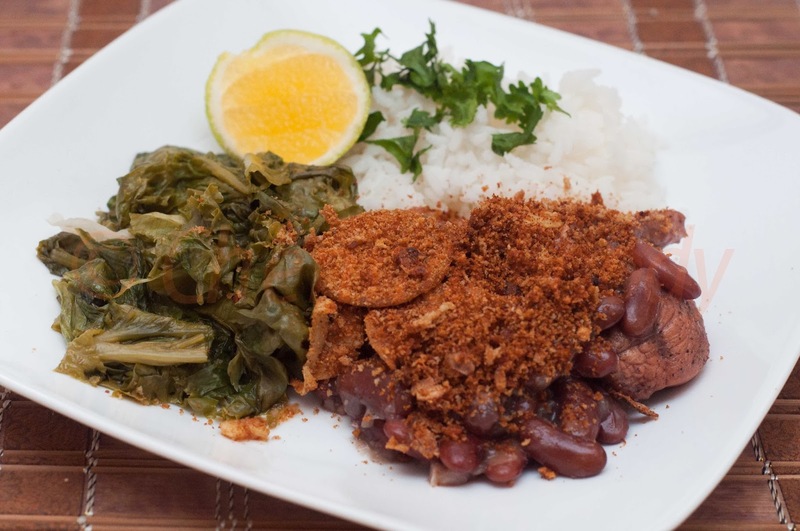 Serve with rice topped with coriander, a slice of orange, steamed greens, the black bean chicken gravy topped with the farofa.